There are so many reasons to choose telemedicine when you need treatment for a non-emergent condition. Modern life has Americans juggling hectic work schedules coupled with caring for a home, family members and more. Luckily, the modern era we live in has also brought advanced technologies that can make our day-to-day lives easier. Just as it has made it more convenient to stay in touch with friends and family who live far away, video conferencing is now making its way into mainstream healthcare. With a very simple sign up procedure and a fee that is less than many insurance co-pays, you can now video chat with a doctor instead of trekking through traffic to get to a medical facility. Convenience – Save hours out of your day that can be devoted to resting and getting well. Financial savings – The monthly fee to consult with a doctor licensed in your state is less than insurance premiums and even many co-payments for one visit! Treatment away from home – No more frantic searches for the nearest doctor’s office while you’re vacationing. Talking with a doctor via telemedicine chat will allow you to continue to enjoy your vacation as much as possible. Healthcare in rural areas – Many people across the country don’t have easy access to a doctor or hospital of any kind due to their rural location. Now, the doctor’s office comes to you, no matter where you live. Help for homebound patients – For those who are elderly or handicapped, making an in-person visit to a doctor can be extremely difficult and tiring. 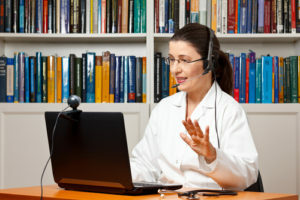 Virtual health conferencing gives those patients better healthcare choices and treatments. Better access to specialists – Specialist physicians can be few and far between, making it next to impossible for many patients to secure an appointment to get the diagnosis, treatment and care that they require, regardless of where the specialist is located. Improved health in chronically ill patients – People living with chronic illness often find the commute to their doctors’ offices excruciating and, quite literally, intolerable. This means that many chronically ill patients don’t get the regular care and medication required to control their conditions. More involved patients – The access to once difficult-to-achieve healthcare motivates patients to become more involved and invested in their own health. The long list of benefits that accompany telemedicine treatment ultimately mean improved patient care. Better and easier access to necessary healthcare means that health concerns can be addressed before they turn into urgent situations. Avoiding the emergency room and urgent care centers will allow emergency room physicians to focus on true emergencies, improving the quality of emergency medicine care as well. Telemedicine is the future of healthcare in the US, and it will bring numerous positive changes to our country’s medical system.